I've become fascinated with a blog called "One for the Journey," written by a woman named Carrie who lives and works at McMurdo Station, Antarctica, at the bottom of the world. Her writing is detailed and clear. I feel like I am right there with her as she stands in awe of the landscape and also knits to pass time. Her photographs are spectacular. 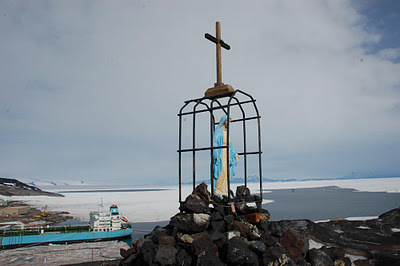 I learned from Carrie's blog the other day that Antarctica includes a statue of our Blessed Mother, called "Our Lady of the Snows," A.K.A. "Roll Cage Mary." It is a memorial to a man who died when his bulldozer fell through the ice. In 1995, the statue was restored by a group of Carmelite nuns from Christchurch, New Zealand.